So, you’re ready to sit down and plan a new book. Are you excited? I hope so. You’re about to create a new reality! Can you imagine it, that fresh page that’s full of potential? 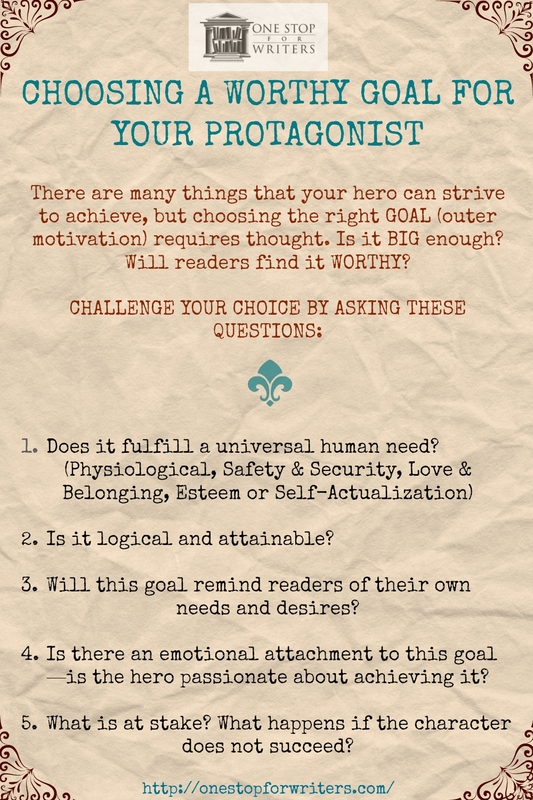 Your main character is going to…um, do things…in your novel. A great many things! Exciting things. Dangerous things. There might even be a giant penguin with lasers shooting out of its eyes, who knows? But here’s a fact, my writing friend…if you don’t know WHY your protagonist is doing what he’s doing, readers may not care enough to read beyond a chapter or two. It doesn’t matter how well drawn your hero is or what cool and trippy things he does in a story…if readers don’t understand the WHY behind his actions, they won’t connect to him. We’re talking about Motivation, something that wields a lot of power in any story. It is the thread that weaves through a protagonist’s every thought, decision, choice and action. It propels him forward in every scene. Because of this, the question, What does my character want? should always be in the front of your mind as you write. More importantly, as the author, you should always know the answer. Your character must have a goal of some kind, something they are aiming to achieve. It might be to win a prestigious award, to save one’s daughter from kidnappers, or to leave an abusive husband and start a new life. Whatever goal you choose, it should be WORTHY. The reader should understand why this goal is important to the hero or heroine, and believe they deserve to achieve it. Fiction should be a mirror of real life, and in the real world, HUMAN NEEDS DRIVE BEHAVIOR. Yes, for you psychology majors, I am talking about Maslow’s Hierarchy of Human Needs. Physical needs, safety and security, love and belonging, esteem and self-actualization are all part of what it is to be human. If you take one of these needs away, once the lack is felt strongly enough, a person will be DRIVEN to gain it back. The need becomes so acute it can no longer be ignored–it is a hole that must be filled. If someone was threatening your family (safety and security) what might you do to keep loved ones safe? If each day you went to a workplace where you were treated poorly by your boss (esteem), how long until you decide to look for a new job? 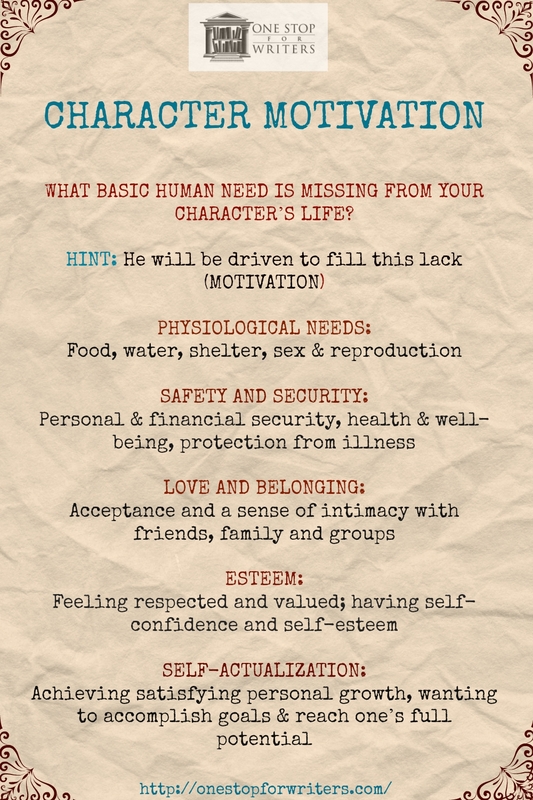 These needs are real for us, and so they should be real for our characters. Ask yourself what is missing from your character’s life. Why do they feel incomplete? The story becomes their journey to fill this lack. If your story has an antagonist or villain, you want to spend some solid time thinking about who they are, why they’re standing in the hero’s way, and what motivates them to do what they do. The reason is simple…the stronger your antagonist is, the harder your hero must work to defeat him. This also means the desire of achieving the goal must outweigh any hardship you throw at your hero, otherwise he’ll give up. Quit. And if he does, you’ll have a Tragedy on your hands, not the most popular ending. Our job as authors is to challenge our heroes, and create stakes high enough that quitting isn’t an option. Often this means personalizing the stakes, because few people willingly put their head in an oven. So make failure not an option. Give failure a steep price. The problem is that with most stories, to fight and win, your character must change. And change is hard. Change is something most people avoid, and why? Because it means taking an honest look within and seeing one’s own flaws. It means feeling vulnerable…something most of us seek to avoid. This leads us to one of the biggest cornerstones of Character Arc. To achieve a big goal, it makes sense that a person has to apply themselves and attack it from a place of strength, right? Getting to that high position is never easy, not in real life, or in the fictional world. In a novel, the protagonist has to see himself objectively, and then be willing to do a bit of housecleaning. Characters, like people, bury pain. Emotional wounds, fears, and vulnerability are all shoved down deep, and emotional armor donned. No one wants to feel weak, and when someone takes an emotional hit after a negative experience, this is exactly what happens. They feel WEAK. Vulnerable. What is emotional armor? Character Flaws. Behaviors, attitudes and beliefs that a character adopts as a result of a wounding event. Why does this happen? Because flaws minimize expectations and keep people (and therefore their ability to cause further hurt) at a distance. 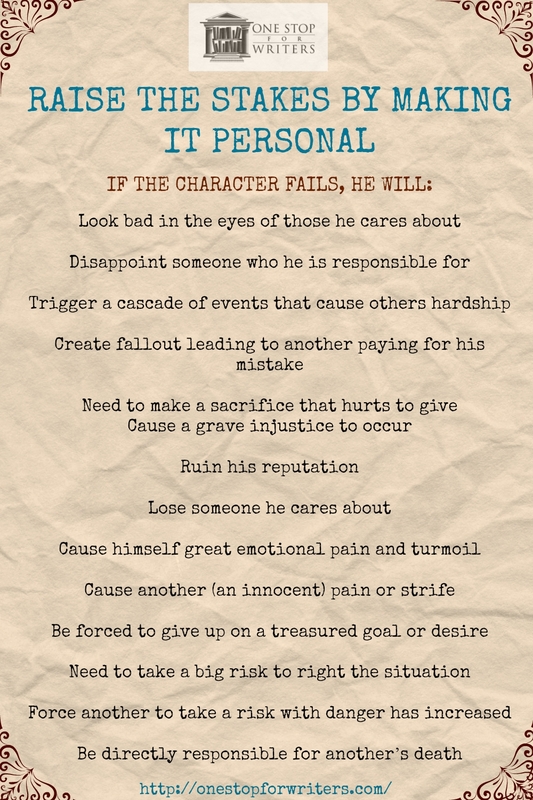 But in doing so, flaws create dysfunction, damage the protagonist’s relationships and prevent his personal growth. And due to their negative nature, flaws also tend to get in the way, tripping the character up and prevent him from success. Fear, a deeply rooted one, is at the heart of any flaw. The character believes that the same painful experience (a wound or wounds) will happen again if unchecked. This belief is a deeply embedded fear that blinds them to all else, including what is holding them back from achievement and happiness. To move forward, the protagonist must see his flaws for what they are: negative traits that harm, not help. He must choose to shed his flaws and face his fears. By doing this, he gains perspective, and views the past in a new light. Wounds no longer hold power. False beliefs are seen for the untruths they are. The character achieves insight, internal growth, and fortified by this new set of beliefs, is able to see what must be done to move forward. His positive traits fortify him, and freed from fear, the character is ready to make the changes necessary to achieve their goal. Why Does Character Arc Hold Such Power Over Readers? This evolution from “something missing” to “feeling complete” is known as achieving personal growth in real life, which is why readers find Character Arc so compelling to read about. As people, we are all on a path to becoming someone better, someone more whole and complete, but it is a journey of a million steps. Watching a character achieve the very thing we all hope to is very rewarding, don’t you think? Our bestselling Thesaurus books (including the Emotional Wound Thesaurus!) are all part of One Stop For Writers, along with many other upgraded and enhanced description collections? You can also access many worksheets and templates to help with Character Arc, or take our Character Wound & Internal Growth Generators for a spin. And don’t worry, that Character Arc & Story Structure thing? One Stop’s Story Maps leads you through the stages step by step. Character Arc has never been easier to grasp! And while you’re poking around, check out our new Scene Map and Timeline Tools. Are you NaNoing this year? How is your Character Arc coming along? Let me know in the comments! This entry was posted in Basic Human Needs, Character Arc, Character Flaws, Character Traits, Character Wound, Characters, Description, Emotion, Emotion Thesaurus Guide, Empathy, Fear, Motivation, One Stop For Writers, Plotting, Positive & Negative Thesaurus Guides, Show Don't Tell, Uncategorized, Villains, Writing Craft, Writing Lessons. Bookmark the permalink. After all these years, I finally found out what character arc is. I kept hearing this, reading about it. Your explanation has shown me that I’ve been doing this. Ahh, full steam ahead with my WIP’s. ChiiMiigwitch, Many thanks. Oh joy of joys. Been following you for years and just no saw this. As is said, when the student is ready, the teacher will appear. Oh, we’re so happy to hear this. Sometimes it just takes hearing something a certain way for it to click. Happy writing! I’m struggling to dramatise a true story from history through the eyes of a two key participants who began as strangers coming together to deal with a horrifying situation and ended as enemies, the one challenging the other to a duel which did not take place but ended in court in a suit for slander. The hardest part is understanding motivation and how the relationship broke down over two and a half years. They both began with what appears to have been the same goal but the conflict was, I believe, over differences in how to achieve that goal. Neither achieved the specific goal. One went on to pursue a successful career, the other was able, eventually, to continue doing what he had always done, despite losing the legal challenge. This article will help me in my struggle! Thank you. Did you see me googling “character arc” this morning? Great post! Very helpful! One of the best, most accessible pieces I’ve read on “character arc.” Thanks, Angela. I just discovered “Writers Helping Writers,” and I’m looking forward to more! Thanks so much Rhonda! Very glad you found your way to WHW, and glad this post was helpful. Happy writing! Extremely helpful; thanks so much! When I discovered this website, I was so excited! I am a young writer and am trying to improve my skills by doing NaNoWriMo. Do you have any tips and/or tricks for me? Great post, thanks! Very helpful. I have a quick question: Is it okay if the protagonist has TWO needs taken away like safety & security AND love & belonging or is this too much? Thanks! Hi there! I think that often, wounds and life experiences do compromise more than one wound. To use a popular and real-life example, look at Erin Brockovich. We don’t know exactly what her wounds are, but at the start of the story, she’s missing both security and esteem as she looks for a job—any job—so she can provide for her family. This is actually fairly realistic, but it’s obviously more difficult to write. I’ve found that the best way to handle this is to have the character pursue the most pressing need first. In Erin’s case, she needs safety and security for her family in the form of being able to buy food and pay the rent. So she gets the job at the lawyer’s office. Once that need was met, she moved on to the next most pressing need. There’s a scene in that movie where she says fighting with her love interest about her job, and she says, “Finally, I’ve got people respecting me. I never had that before.” Throughout the course of this movie, she ends up meeting both of those needs by focusing on one at a time. Now here’s the caveat: while a wound might compromise more than one basic need, you have to decide if both of those needs are behind the inner motivation (why the character wants to achieve her story goal), or if one of them is the main driving force. Erin’s outer motivation was to win her case against P&E. Why? Not out of a need for safety and security, because by the time she gets into that case, that need is already taken care of. In her situation, I believe her inner motivation is esteem. People are believing in her and depending on her and she wants to honor that and do right by them. So yes, characters can be missing more than one need at the start of the story. If this is the case, the needs should be addressed one at a time, starting with the most vital one. When it comes to the need associated with a character’s inner motivation, most of the time, it only comes down to one. What a wonderful post. The details make it much easier for a “pantser” to get started. You put so much practical info and details into each post! – It’s like a mini-course every time I read. Thanks so much for being so generous. A great breakdown of the character arc. This makes it totally manageable. Thanks, Angela! As always, a information packed post. Thanks!